In Poltergeist, something from beyond reaches into our realm, into an average and safe American home, and snatches away an innocent child. This spookhouse haunter makes excellent use of the common fear that nothing is scarier than a child in peril, and it popularized the trend of child-obsessed entities in paranormal thrillers. Not to mention the eccentric medium coming to the rescue. The film also moved ghost stories away from those old, spiderweb-ridden, gothic haunted houses into the average suburban neighborhood—a far more invasive notion. Released in 1982 during a particularly iconic summer, Poltergeist was extremely influential on an entire subgenre of paranormal thrillers. Although credited to director Tobe Hooper, screenwriter and producer Steven Spielberg’s presence remains the more influential creative force behind the camera. Nevertheless, the question of the film’s true director is a matter of Hollywood lore and contention. But the evidence of Spielberg shaping the material is right there on the screen. 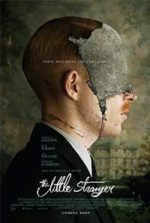 It looks and feels like a Spielberg film, from its concentration on family to its expert manipulation of the audience’s tension. More than thirty years later, Poltergeist still works and still scares, even if its formula is now more common than ever. Poltergeist opened just a week after the Spielberg-directed E.T. : The Extra-Terrestrial debuted at Cannes and contains many of the filmmaker’s associated Spielbergisms. Within the first moments of Poltergeist, you get the feeling that down the street Elliot is busy feeding Reece’s Pieces to an alien. Indeed, the two films were shot a mere 20 minutes from one another. The story is familiar; Roger Ebert wrote, “This is the movie The Amityville Horror dreamed of being.” It centers on the Freelings, an average American family in an idyllic middle-class suburban neighborhood, where the children’s room is lined with Star Wars memorabilia and the teenage daughter spends too much time on the phone. Though the paterfamilias isn’t another in a long line of absent Spielberg fathers, Steven’s (Craig T. Nelson) money-minded conservative streak finds him reading Ronald Reagan’s biography, whereas his wife Diane (JoBeth Williams) smokes grass. They have three children: the promiscuous teen Dana (Dominique Dunne), their nervy son Robbie (Oliver Robins), and their youngest, Carol Anne (Heather O’Rourke), who sports a Village of the Damned haircut and manages to be at once cute and creepy. A very Spielbergian device introduces these characters in the opening sequence: the family Golden Retriever goes from room to room, sniffing for crumbs and thereby giving us a look at the entire family—a cute, yet clever introductory note. 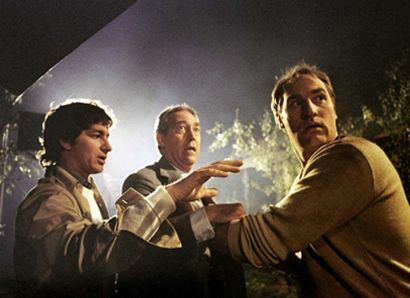 Spielberg had admired Hooper’s The Texas Chainsaw Massacre (1974), and their mutual affection for Robert Wise’s The Haunting (1963) inspired them to collaborate on a haunted house movie (just as Spielberg admired Joe Dante’s Piranha, leading to a collaboration on Gremlins). Screenwriters Michael Grais and Mark Victor delivered a first draft of Poltergeist, which Spielberg rewrote and planned to executive produce, as principal photography on E.T. : The Extra-Terrestrial was already scheduled to be begin shortly after Poltergeist was slated to finish. However, from the outset, Spielberg shaped the production to his specifications; he delivered storyboards, offered on-set instruction to Hooper, and reset shots after Hooper had already prepared them. Spielberg’s involvement was discussed during an interview conducted by the L.A. Times in which he remarked on his involvement: “Tobe isn’t what you’d call a take-charge sort of guy. He’s just not a strong presence on a movie set. If a question was asked and an answer wasn’t immediately forthcoming, I’d jump up and say what we could do. Tobe would nod agreement, and that became the process of the collaboration.” Pre-release rumors and contentions from the cast and crew further suggested Spielberg directed the majority of the film, and prompted a Director’s Guild investigation. After shooting wrapped and Hooper turned in his cut in October 1981, Spielberg and co-producer Frank Marshall took over and, according to many reports, kept Hooper out of the post-production process until the director finally saw his film at a screening the following April. Composer Jerry Goldsmith said he never even talked to Hooper. Doubtful audiences will ever receive an accurate account of who did what; although, as discussed, much of the film seems more aligned with Spielberg’s style and sentiments than those of Hooper. Everything from the technical methods to the scare setups feel derived from Spielberg’s mind, earning comparisons to titles like Jaws, Close Encounters of the Third Kind, and E.T. : The Extra-Terrestrial—just as Spielberg’s other producer-only credits from the eighties (Gremlins, The Goonies, etc.) each feel uniquely Spielbergian. By contrast, consider Hooper’s stale treatment of Invaders from Mars (1986), another film about a typical American family in peril—almost nothing about the film seems directed by the same person who helmed Poltergeist. 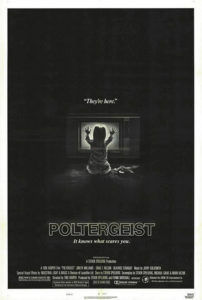 And like most Spielberg films from the 1980s, Poltergeist was a colossal hit. 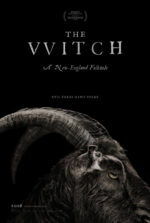 Audiences were not dissuaded by the intense and sometimes gory material, either—it originally received an R rating from the MPAA, which Spielberg appealed for a more commercial-friendly label. Remember, this was before the PG-13 rating, and so the film was eventually released as a mainstream PG. Now whole families could see gory moments involving Marty (Martin Casella), the paranormal investigator who hallucinates a bursting steak, a mouth full of maggots, and a grotesque scene in which he tears his face off in the mirror. The PG rating paid off to the tune of $76.6 million in domestic receipts. In the coming months and years, absurd rumors of a curse haunting the cast and crew—because the production used real skeletons (procuring real ones was cheaper than buying plastic ones) during the pool scene—were followed by the tragic deaths of Dunne and later O’Rourke, the former murdered, the latter by complications from disease. If nothing else, such anecdotes serve to reinforce Poltergeist’s lasting effect, the power of its scares and its ability to connect with moviegoers and linger long afterward. 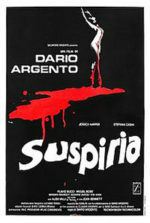 Likewise, the film’s influence on the modern paranormal thriller remains incalculable. It’s impossible to watch Insidious, Paranormal Activity, or The Conjuring and not see how Poltergeist has shaped the experience, even more than Spielberg and Hooper’s source of The Haunting. Indeed, what Poltergeist does best is offer a scenario where an innocent child is taken and the parents, at first, are left helpless to carry out their parental duty as protectors, until of course, they reestablish themselves and all is returned to a safe state of normalcy in the end. This is the plot of virtually every paranormal thriller today. Through a modern viewer’s eyes, Poltergeist contains basic plotting and later sequels soured its simplicity, but the original plays considerably well after all these years, just as most Spielberg titles have a timeless quality and seemingly limitless influence.